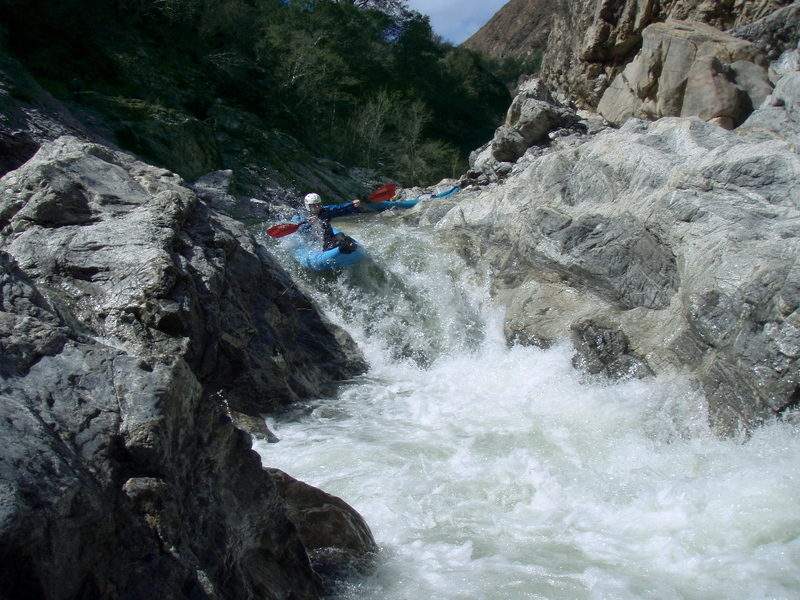 This writeup shows Arroyo not-so Seco at around 500 cfs, when it verges on class V, although easier lines are available in most of the drops. For the regular low-water writeup, see Arroyo not-so Seco. 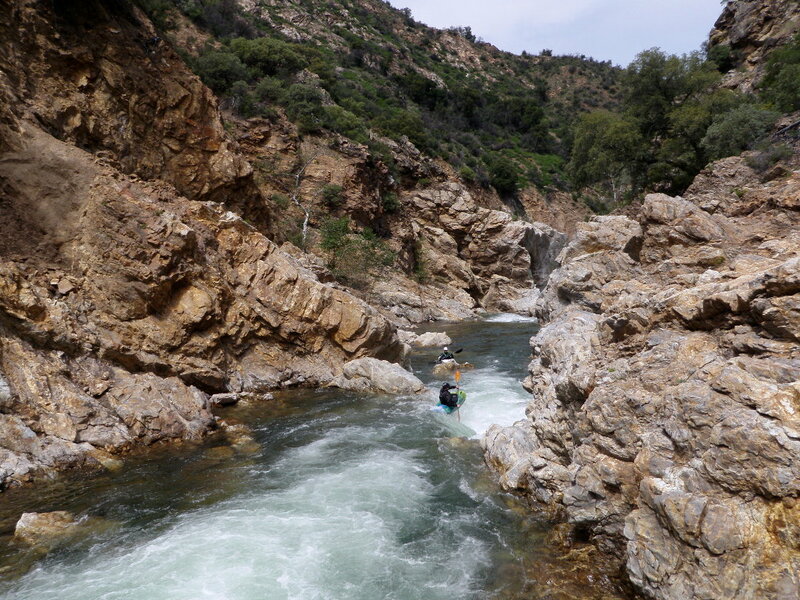 Boaters who arrive to find this creek running above 450 cfs might consider hiking up the gated dirt road only to Santa Lucia Creek, which avoids Recirculator, the highwater class V rapid. 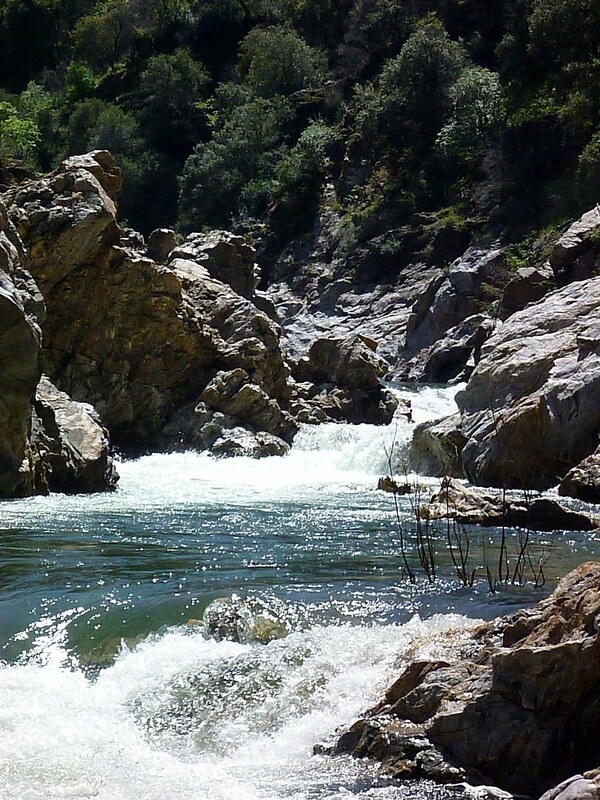 However the steep rapids on Santa Lucia Creek can be brushy in spots. 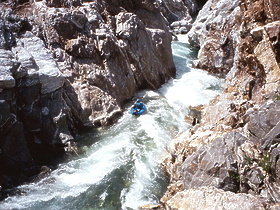 Put in below the pack bridge on river left. 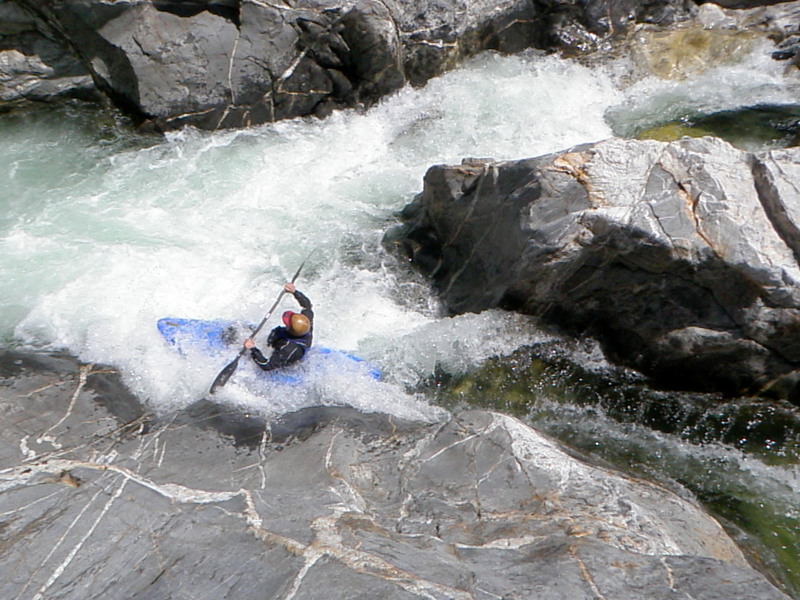 Willow Creek comes in on the left, just above a class II boulder bar rapid followed by a long class III slalom. 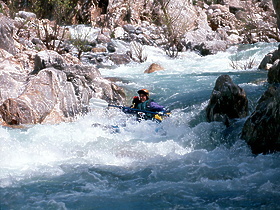 Two major rapids in quick succession. 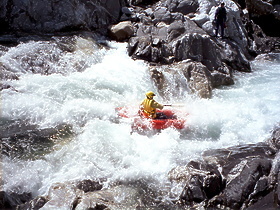 The first is class IV- at low water but gets easier at higher flows. 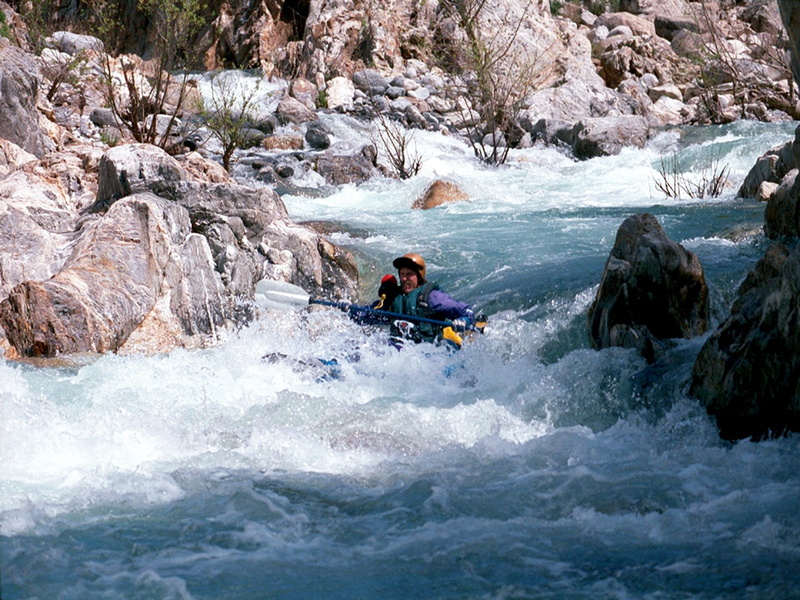 At low flows the second is class IV with an undercut left wall; easy portage on the right. At higher flows this rapid becomes a recirculating class V monster, hence its name Recirculator. If you run it at high or medium flows, be prepared with throwbags. 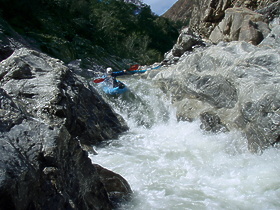 Confluence with Santa Lucia Creek amidst a class III rapid. The canyon narrows and deepens. The next several rapids merge, but can be scouted together high on either bank. The steep sliding falls looks worse than it seems to be. The staircase drop should be run left, or left of center, to avoid a rock-imprisoned reversal on the right. Too Tight, a narrow passage between the left wall and an island. The high-water alternative on river right is recommended above 350 cfs, and is runnable lower than that. After a good recovery pool, a steep class III rapid merges with Photo Rock Falls below to create a suspenseful combination. Photo Rock Falls can be run either right or left of a plug-rock below. Mucho Cajones, class IV+. 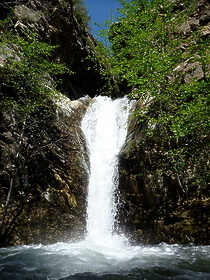 An 8 foot falls with a fast-moving pool below. At most flows there is an ugly backwash into an undercut wall on the right. 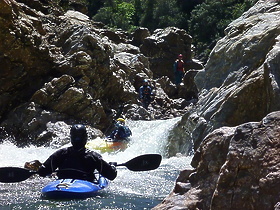 The drop gets easier as flows increase, because sneak routes develop on the left, although the eddy below gets smaller and harder to catch. 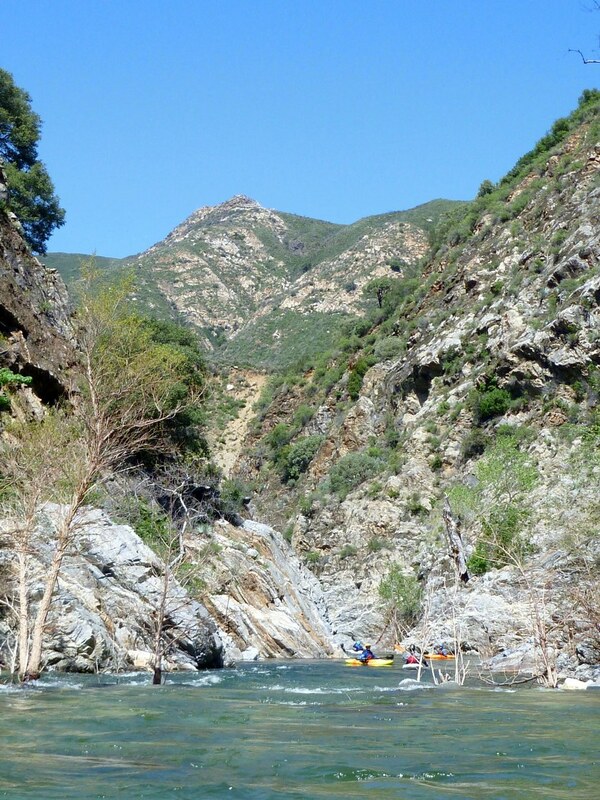 Relatively easy portage on the left. 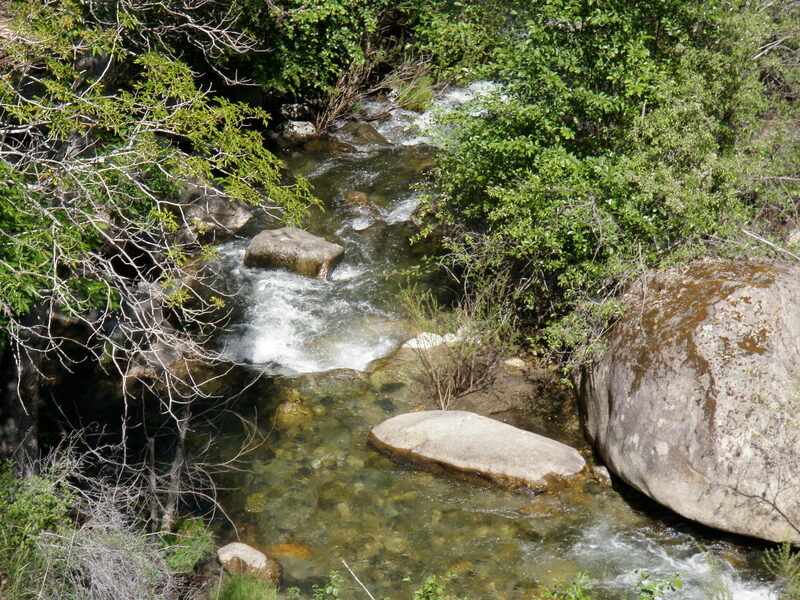 Below, the river flows thru a narrow zig-zag rock cleft with an amazing rock-encased eddy on the left. 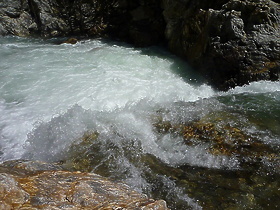 At flows above 600 or so, a nasty hole starts to develop below the eddy in this zig-zag rock cleft. 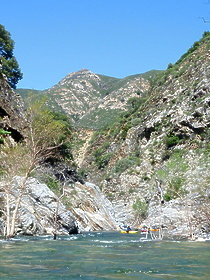 The Pit, end of class IV canyon. Remaining rapids are class II-III boulder bar affairs that become very enjoyable at higher flows. Hidden below a steep class III created by a large rock outcropping and midstream island, a sidestream on the left creates a spectacular 10 meter waterfalls into a plunge pool. Visible from the carry-in road, a steep boulder-choked drop with a big rock in the middle looks most runnable on river right, but watch out for an undercut rock on the right bank, and underwater rocks in the channel. At higher flows good routes develop in the middle channel moving right of the big rock, and right of center with a goal-post jump boof. 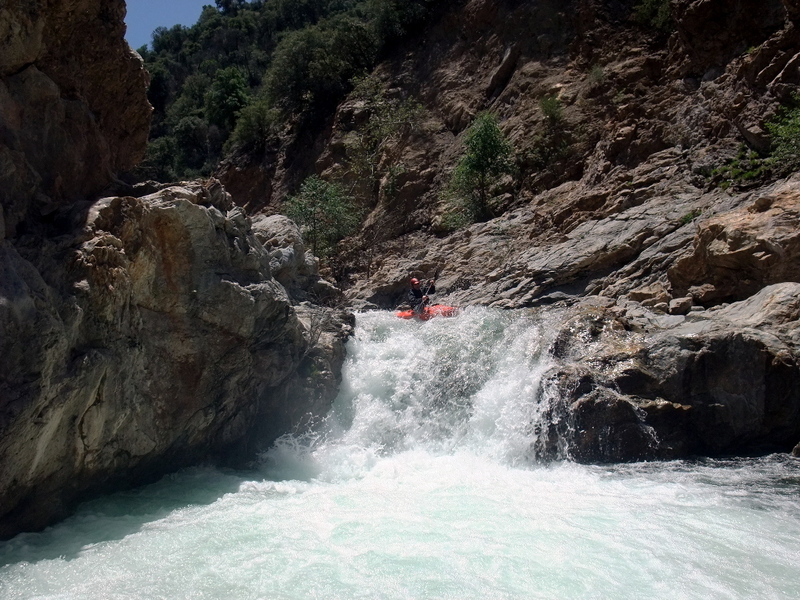 At low flows this rapid is easiest left of center thru willow branches, over a > 1 meter falls; this route is fine at higher flows as well. 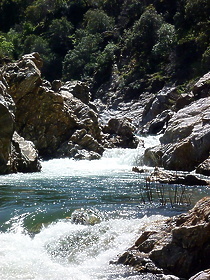 Arroyo Seco picnic area on the right bank. Rest rooms. This is a good place to dry gear while waiting for your driver to return. 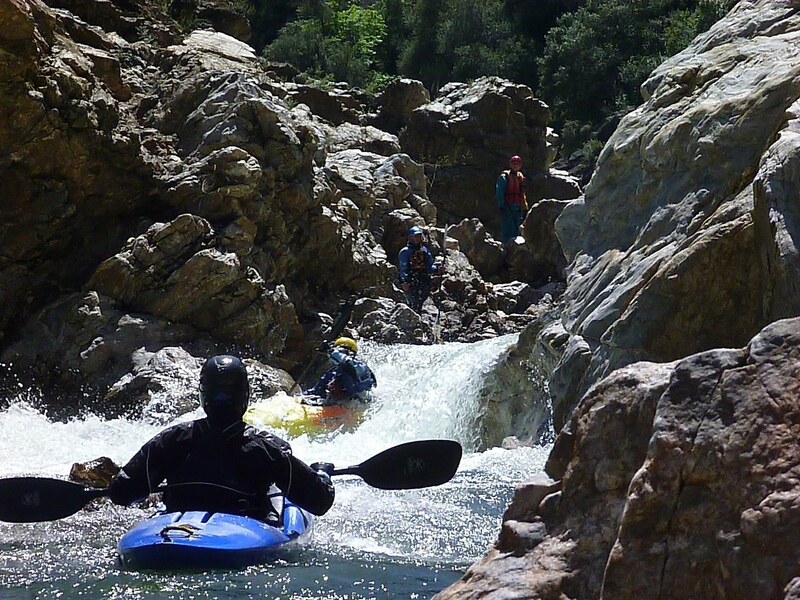 You might want to run the rapid (right side) under the Arroyo Seco road bridge and take out just below. 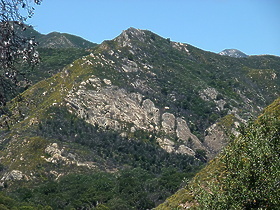 To reach take-out: From the south on US 101 at Greenfield (north of King City) take G16 west 5.7 miles to Arroyo Seco bridge, take-out for lower 9.5 mile Schwind run. From the north on US 101 at Soledad, just after crossing the Salinas River, take G17 southwest 9.3 miles. G16 and G17 intersect on the south bank near Schwind's take-out bridge. Continue west for approximately 7 miles. Where G16 bears right uphill to Carmel, stay left on Arroyo Seco Road. Miller's Lodge, recommended take-out for the upper 5 mile Schwind run, is a short distance ahead. Continue 4 more miles uphill to the USFS camp and picnic grounds at Arroyo Center (fee area). To reach put-in: Drive your vehicle as far uphill as possible past the west campground, to a locked gate. At the end of the day, walk uphill to retrieve your vehicle.